I guess this is a copycat Olive Garden recipe? I've never had their version, but I found this version over at Mel's Kitchen Cafe (Shocker, another yummy recipe from Mel's site). This turned out sooooooo good. 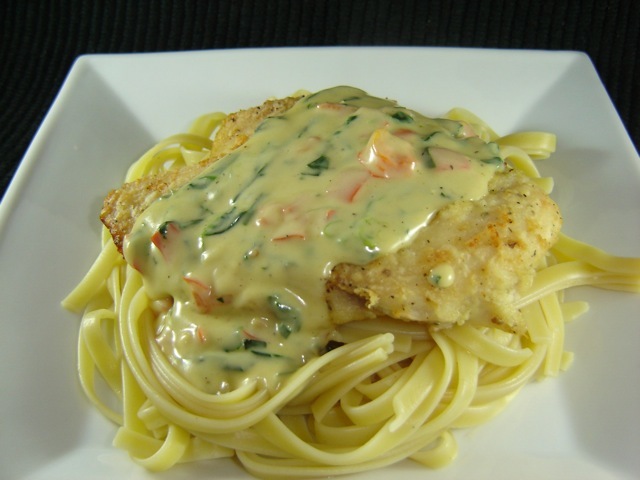 The sauce is so creamy and flavorful, you would never know the cream was cut way back and low-fat milk was added in its place. I made the entire sauce recipe, but I used one extra-large chicken breast from Costco and cut it in half, horizontally. I love tonz of sauce, but the full recipe gave me more than plenty for two people with some leftover. Next time, I will probably cut the sauce in half if I am only making two servings. This really does taste like it came from a fancy Italian Restaurant! In a shallow pie plate or similar dish, combine the flour, salt, pepper, basil and oregano. Dip each chicken piece in the flour mixture until both sides are well coated. In a large 12-inch nonstick skillet, heat 3 tablespoons of the olive oil over medium heat until the oil is hot and shimmering. Carefully place the chicken breasts in the pan, cooking them for 2-3 minutes on each side, until they are golden and browned but not cooked all the way through (they’ll finish up in the oven). Don’t scoot the chicken around once you lay it in the hot oil! Let the oil work it’s magic to sear the crust on the chicken. If you get all antsy and try flipping too early and/or moving the chicken around the pan, the breading is likely to fall off. Gently remove the chicken to a foil-lined, lightly greased baking sheet and bake in the preheated oven for about 15 minutes, until the chicken is cooked through. Set aside and tent with foil until ready to use. While the chicken is cooking, heat a large pot of water to a boil and add the noodles, cooking until al dente. Also, wipe out the skillet with a couple paper towels and return it to medium heat, adding the remaining 2 tablespoons olive oil. When the oil is hot, add the garlic and bell pepper, sauteing for 2-3 minutes. Stir in one tablespoon flour and stir constantly while cooking for another minute. Add the chicken broth to the skillet and bring the mixture to a low simmer, whisking constantly, until slightly thickened, about 3-4 minutes. In a small liquid measure, whisk together the cornstarch and cream. Add the spinach, milk and cream mixture to the skillet. Bring the mixture to a simmer and cook, stirring occasionally, until the spinach is wilted and sauce is slightly thickened, about 4 minutes. Stir in the Parmesan cheese. When the pasta has finished cooking, drain and return it to the pot. Toss the pasta with half of the cheese sauce. Place some of the coated pasta on each plate. Top with a breaded chicken breast and spoon some of the sauce over the top of the chicken and pasta. Serve immediately. *Mel's Notes: if the chicken breasts you are using are overly thick, you can butterly them, cutting all the way through so you end up with two thinner cuts of chicken breast. Second note: I would say this recipe is right on the edge of just having enough sauce but not an overabundance, so if you like things on the saucier end of the spectrum, feel free to double that part of the recipe. Looks delicious. My husband loves pasta and is always wanting to try new dishes. Hey Jenn thanks for your comment on my Ice Cream Bread Post. When I was flipping through the cookbook I just knew I had to try it. With 2 ingredients I knew that if it was a fail, I wouldn't be mad. You know, it's 9:22 p.m. here in Chicago and I was about to send my husband out to get some junk for dinner cuz I'd spent all day baking cupcakes. I go clicking around and find this gem AND I've got all of the ingredients. Late dinner, sure but I'm excited to try it!